MORRISVILLE, NC—TrialCard Incorporated, a leader in access, affordability, adherence, and engagement solutions for patients and healthcare providers, today announced that it has received ISO/IEC 27001:2013 certification for its Information Security Management System (ISMS). ISO/IEC 27001:2013 is an ISMS standard published in October 2013 by the International Organization for Standardization (ISO) and the International Electrotechnical Commission (IEC). 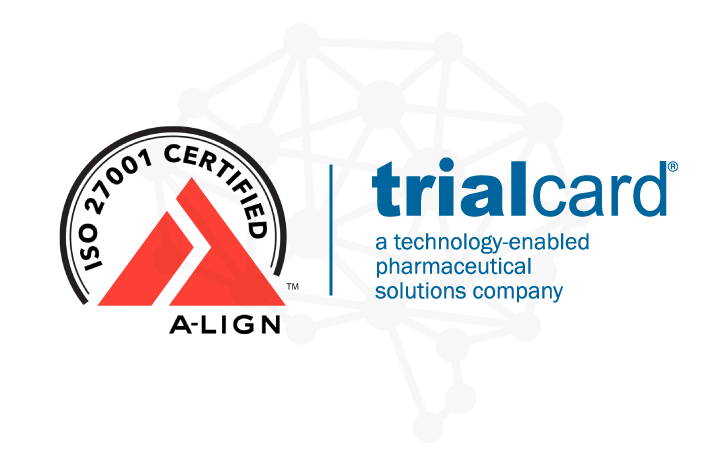 A-lign, an independent, third-party auditor, found TrialCard to have technical controls in place and formalized IT Security policies and procedures. A-lign is an ISO/IEC 27001 certification body accredited by the ANSI-ASQ National Accreditation Board (ANAB) to perform ISO/IEC 27001 certifications. TrialCard has implemented several security measures and countermeasures that protect it from unauthorized access or compromise and IT personnel were found to be conscientious and knowledgeable in best practices. Compliance with this internationally recognized standard confirms that TrialCard’s security management program is comprehensive and follows leading practices. This certification demonstrates TrialCard’s continued commitment to information security at every level and ensures that data security has been addressed, implemented and properly controlled in all areas of the organization. For more information about TrialCard’s ISO/IEC 27001 certification and its commitment to data security and privacy, visit its online Resources library. TrialCard Incorporated provides patient affordability, medication access and adherence, patient support, and clinical trial supply management services on behalf of pharmaceutical manufacturers. Founded in 2000, TrialCard has connected over 30 million patients with nearly $12 billion in branded drug savings to date.